In 2007 KET filmed an episode of Kentucky Muse at the Festival, which was then called the JP Fraley Mountain Music Gatherin’. 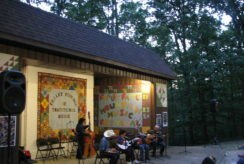 The one-hour documentary “Mountain Music Gatherin’,” directed and produced by Tom Thurman, takes viewers to the 2007 gatherin’ at Carter Caves State Resort Park near Olive Hill, Kentucky. Through interviews with musicians and fans, live Music Performances, and rare home movies and photographs, the program explores what “mountain music” is and tells the story of how J.P. and Annadeene Fraley created a beloved Kentucky musical tradition.